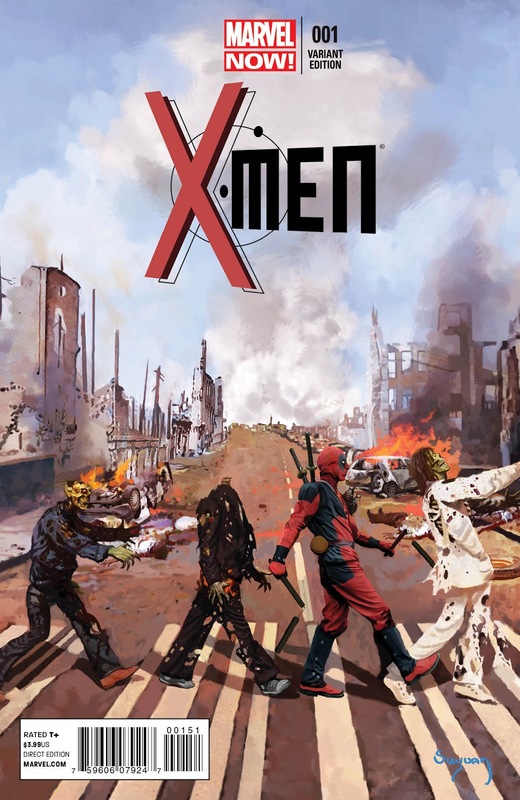 Marvel has revealed a Deadpool variant cover to X-Men #1 by Arthur Suydam, which comes out 5/29/2013. Marvel is pleased to present your first look at critically acclaimed artist’s, Arthur Suydam, Deadpool variant to X-Men #1! Storm, Rogue, Jubilee, Kitty Pryde, Rachel Grey, Rogue & Psylocke redefine what it means to be a Child of the Atom in X-Men #1, kicking off the all-new ongoing series by the blockbuster creative team of writer Brian Wood (Ultimate Comics X-Men) and artist Oliver Coipel (Avengers VS. X-Men)! An old enemy shows up at the X-Men’s door, seeking asylum from an ancient evil come back to Earth. Meanwhile, Jubilee has come home, and she’s brought with her an orphaned baby who might hold the key to the Earth’s survival…or its destruction! With an imminent alien invasion and an eons-spanning war between brother and sister around the corner, Storm steps up and puts together a team to protect the child and stop a new threat that could destroy all life in the Marvel Universe! Each issue of X-Men includes a code for a free digital copy on the Marvel Comics app (for iPhone®, iPad®, iPad Touch® & Android devices). This May, Wood and Coipel take X-Men in an all-new, all-different direction in X-Men #1!